This is Cookbook Club, a place where we flip through the best new cookbooks to find the recipes and stories that you need in your life. There is no one on the internet that gives better baking advice than Stella Parks. A former pastry chef, and current Serious Eats editor, Parks has an uncanny ability to distill the complex scientific mechanics of baking and the often tedious and lengthy histories of a dish into a sweet and digestible package. In other words, she makes baking fun and makes you smarter in the process. And after six years of researching, baking, researching, and baking some more, she has finally put out her first cookbook, BraveTart: Iconic American Desserts. Parks was adamant that she wanted to write a cookbook that combined “both sides of the coin” when it came to American desserts. There would be recipes for classic baked goods like strawberry shortcake, chocolate chip cookies, and Key lime pie. But it was also equally as important for Parks to include recipes for homemade version of America’s favorite mass-produced sweets like Oreos, Pop-Tarts, and Rice Krispies Treats. "McDonald's apple pies... are unbelievably American." The one dish that she initially didn’t want to include was a recipe for apple pie. “My reasoning at the time was that apples are not even indigenous to North America,” she explains. “They were brought over by colonists!” Parks also points out that every country that has a history of growing apples has a traditional apple pie-like pastry. “It’s a famous American dessert, but we don’t have special claim on it,” she says. Roll each portion of dough into an 11-by-13-inch rectangle, using as much flour as needed to prevent sticking. Stack on a parchment-lined cutting board or baking sheet, with a sheet of parchment between them, cover with plastic and refrigerate at least 2 hours, or up to 24. Cut each chilled sheet into four 5-by-6-inch rectangles. Gather scraps, knead briefly, roll into a 6-by-13-inch strip, and cut two additional pieces. Arrange on two parchment-lined baking sheets and refrigerate while you prepare the filling. Peel, core, and dice the apples into 1/4-inch cubes. Measure exactly 12 ounces (3 level cups) into a large bowl, and set scraps aside for snacking. Even if it’s a very small amount, do not add any extra apples to the filling! Toss apples and apple-cinnamon powder together with a flexible spatula, then add melted butter, molasses, and lemon juice (this cannot be done in advance). Imagine each portion of dough as an open book: Lightly brush the edges of the “right page” with water, then place 2 tablespoons filling inside that boundary. Close the “book” and crimp the short sides with a fork, leaving the long side open, like a pita pocket. Repeat with remaining dough. To finish, pick up each pastry and spoon in another tablespoon of filling, letting gravity help you work it into the corners. Return to the baking sheet and crimp with a fork to seal. Refrigerate turnovers until firm, about 45 minutes, or up to 4 hours. Adjust oven racks to the upper- and lower-middle positions and preheat to 400°F. Mix sugar and cinnamon together in a small bowl. Lightly brush turnovers with water and sprinkle generously with cinnamon sugar. Snip a few decorative slits across each with a pair of scissors. Bake until the turnovers are puffed, crisp, and golden brown, about 30 minutes. Transfer to a wire rack and cool for 10 minutes before serving. 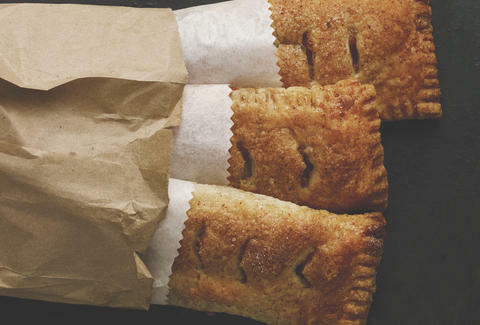 To keep the pastry crisp, store leftover turnovers at room temperature under a cake dome or upturned bowl, and rewarm in a hot oven before serving. In an especially hot and humid summer kitchen, periodically refrigerate the dough to keep it cool and firm. BraveTart: Iconic American Desserts is available for purchase now.